Spring is almost here…and with it, comes the sun. So ask yourself “Are you really drinking enough fluids during the day?” When it comes to water, most of us don’t drink enough of it to keep our bodies functioning at their peaks. Hydration is essential to maintain proper PH balance, kidney function, bowel movements and overall circulation. Although hydration includes various beverages, water is the optimal choice. It is recommended that a person drink 6-8 glasses of 8 ounces per day. If you exercise, are fighting an illness, pregnant or breastfeeding, or the climate is particularly hot, you should drink more. If water is not your first choice, there are other ways to get the required fluids. These include, fruit juices, coffee, iced tea, and flavored waters. It has been determined that moderate amounts of caffeine do not lead to dehydration. Sugar is not an ideal option, generally, but there is no indication that consuming beverages with added sugar will lead to dehydration. 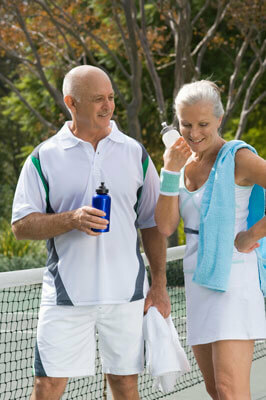 Sports drinks are recommended for athletes to replenish electrolytes lost during intense exercise. It’s unusual, but not impossible to drink too much water. Taking in too much water will dilute the amount of sodium in your body and cause an imbalance leading to serious medical complications. The risk is highest for athletes who participate in endurance sports. Water is easy to obtain. Keeping a water bottle on hand (in the car or on your desk) makes hydrating a snap. So grab your water bottle and make sure to take the time to hydrate every day to feel great. As Always, if you have any health related questions be sure to ask your Fremont Chiropractor at Discover Chiropractic!